The appeal of the subscription box Birchbox isn’t just getting a box full of personal-care goodies in the mail every month: it’s also reviewing the samples that you receive to earn points toward buying full-size versions of those goodies. Now a change to that system is proving very controversial, and some customers want to quit the service because of it. Here’s how Birchbox “points” originally worked. Subscribers review the items that they receive in their boxes every month, receiving 10 points for each review. One hundred points are worth a $10 discount on the Birchbox site, which sells full-sized versions of beauty products. Points had to be cashed in 100 at a time, and expired after one year, but they were easy to rack up. Then the company made what might seem like subtle changes to the program, but they make a big difference for subscribers who love posting reviews and getting discounts. Now the points expire after only six months, and customers can only review five items, ever, after July 11: not five items every month. They also earn points for items bought in the shop and for sending gift subscriptions and recruiting other members, but the change does away with what made the program unique. 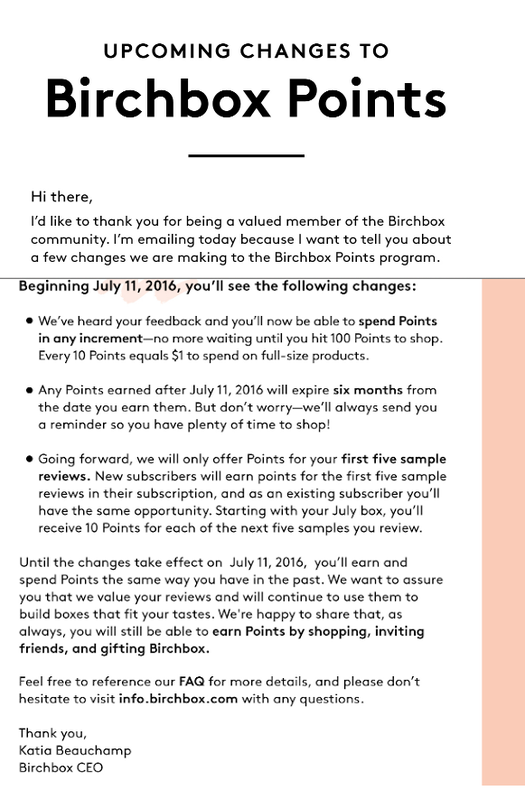 We asked Birchbox for a statement on why they made the change, and they explained that under the new system, customers don’t have to rack up 100 points to get a discount, and can redeem them as soon as they earn them. The points are a strong incentive to leave a review for something that you didn’t actually try, that’s true. There’s probably another reason why Birchbox doesn’t want to keep giving subscribers $1 in store credit for every product review they write, though: the company has been struggling this year, laying off 15% of its employees earlier this year and shutting down its Canadian subscription business. The good news is that customers who have prepaid for a whole year (which costs $110) report on Facebook that they’ve had no problems receiving refunds for the remaining part of their subscription. Next Does Simply Being Near A Luxury Store Turn People Into Unfeeling Jerks? Next Up: Does Simply Being Near A Luxury Store Turn People Into Unfeeling Jerks?